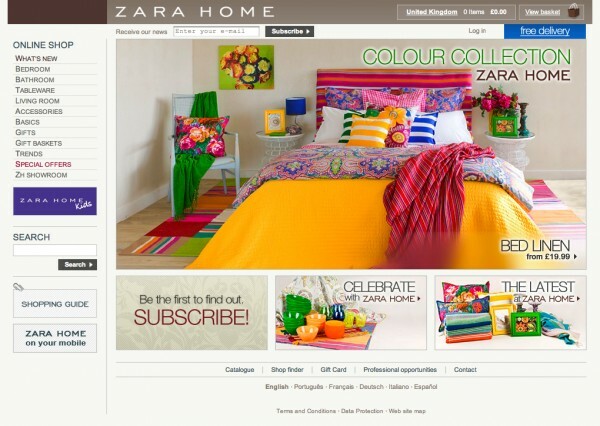 This site, launched in 2007, is run by a subsidiary of Zara parent Inditex, ITX e-commerce Ireland. The site apparently made a loss of €692,000 during the year to the end of January 2009. Initial impressions; the design is on-brand, nice and colourful. It’s clearly an online shop, and you know you’re shopping in the right country. The header is unusually short (and the logo is small), but this does mean most of the homepage is above the fold. Receive our news is very prominent; some people might expect this to be the search box. It doesn’t need to appear on every page, and the position almost crowds out the page heading. There’s also a be the first to subscribe button which is duplication, and looks slightly out of place with the other nice images. The search box is actually quite far down the page; we’re not really encouraged to use it as the search function is not particularly sophisticated. It’s a basic text search returning products (not categories) including all the search terms, and there are no options to refine the search. 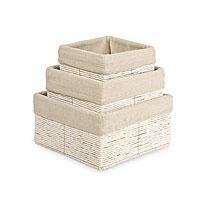 Search for “small table” and you find one page of table accessories which include the word “small” in the description. Search for “furniture” and nothing is found. Free delivery is promised, but when you click on this it’s only over £150 – I wouldn’t bother with this, as it’s not that attractive an offer; customers would expect free delivery over £20 or £50. We’re not told how much delivery is (an astonishing £19 for all orders under £150!) unless you click on the Shopping Guide (which I had assumed would be a style guide) on the left hand side, or on the small See delivery charges link in the shopping basket. In fact it would be easy to enter your address details and get to the payment page before you’re hit with the £19 charge. Navigation is on the right hand side rather than at the top; I suspect because it’s more flexible (and good for SEO). It works fine for the range as most product categories don’t have more than 5 sub-categories. Zara Home Kids is a mini site within the main site with a slightly different colour scheme and its own logo, homepage and product categorisation. 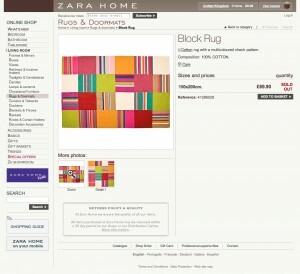 You click on the Zara Home or Zara Home Kids buttons above the search box to switch between the two sites. It’s nice to give the Kids range its own identity (although I would make it more Kids-like) but it would also be good to somehow link the ranges e.g. shopping for tableware in the main section would link to the Kids tableware section. (The solution also means that if you have products from the main range and the kids range in the basket the header of the basket page is the Kids logo). There’s a Zara Home on your mobile link to the iphone app, which is a showcase of product images with a “buy” link taking you to the Worldwide homepage . Not that useful, but nice images to browse through on the tube, and as such it’s rated 2 stars (slightly lower than the main Zara app). There are 15 different country sites, and the current one e.g. United Kingdom is displayed to the left of the shopping basket, almost within the basket. The link (which goes to the list of country sites) is as prominent as the View basket link which it doesn’t need to be, although fortunately if you navigate away and come back again the basket contents are retained. In the footer you can change the language of the site (e.g. view the UK site in German) which has a slight potential for confusion with changing the country site; perhaps some explanation (in text, symbols or flag) would help. Contact details appear at the bottom right, and even then only a link to an email form. There’s no phone number evident, although there is an 0800 number very much hidden within the Terms and Conditions in the Returns section. The 0800 number also appears at the top of the shopping cart, so why not earlier? The email form itself requires you to fill out all 6 fields – there are no optional fields so they don’t really need to state Required fields are indicated with *. The Gift card section describes gift cards which can be bought instore; online gift cards (bought and redeemed online) would work well I think. Just a minor point, but some of the text does look as if it’s written by an non-English speaker e.g. “Gifts for Her – Enter to see it all”. The category pages e.g. Living room are a clever combination of one large feature product with a lifestyle image, descriptive text, special offers (below) and links with images to the sub categories (to the right). Some categories have their own bespoke layout e.g. Gifts, Basics and Trends, and some e.g. Gift baskets link straight to the products without the subcategory level. It’s a good example of tailoring the navigation to suit the product range. Product summary pages e.g. Kitchen textiles are well laid out with large (just over 200px square) thumbnail images. There’s a mixture of cutout/ white background and coloured background images, but on a pale page background with a slight image border they work well together. Products are shown in a random order and there are no sort or filter options. I don’t really see this as an issue as there are 12 products per page and most subcategories have 1 or 2 pages (with the option to view all). It encourages you to explore the range, and focusses on the products rather than the prices. Where a product is available in more than one colour/ pattern this is shown with a clickable icon to the top right of the thumbnail image, which changes the thumbnail image itself. The choice is then carried through to the product page. This is one of the best solutions I’ve seen for displaying product with colour/ pattern options. If a product is available in more than one size this is indicated with a price range (e.g. £89.90 – £319.90) and a thumbnail image incorporating the different options. Again, a good solution to presenting options at the summary level. Products which are reduced or on special offer are highlighted with the sale price in a big red font and the original price in small font below. New products are highlighted with a NEW flash across the thumbnail image. There’s no stock information on the summary page which could be slightly annoying if the product is subsequently unavailable on the product page e.g. There are well laid out with a large image (almost 400px square) and good call to action with the add to basket button. There’s a nice Glossary feature to tell you for example what cotton is. Most product only have one image, although there is a More photos section on all products. There’s a good zoom function, although it’s not spelt out that it’s there. There seems to be very few related products set up, which may be a missed opportunity as this is done well elsewhere in the Showroom section. There are good pop up guides to sizes and product care instructions, done in the same way as the glossary. The returns policy is shown below the main product image, striking the right balance I think between showing the information but not in a negative way. Unfortunately this links to the entire terms and conditions section so you have to find the returns policy within it. Offering returns to store is a positive feature. It would be good to see delivery information here too (although maybe £19 is nothing to shout about)! I like how you can scroll between the products within a category with the Previous and Next buttons, and the Back to category link. I’ve mentioned the delivery information (or lack of) earlier. The basket has a good informative layout with an image, colour and size information. There’s an option to Giftwrap your order which appears to be free – so why not shout about this? I would choose to giftwrap everything, just for fun! The process is a clear 4 stages – Shopping basket, Address, Payment, Confirmation. Creating an account with a password is required, although this is handled reasonably well within the same page with radio buttons: This is the first time I am purchasing on the Zara Home website / I have previously purchased on the Zara Home website. Overall this is well designed ecommerce site in terms of the look and feel and functionality, and works well for the particular range of products. The site does the basics very well, although obvious areas for improvement are the search function, offering more ways of viewing and filtering products, and expanding the “We also recommend” related products. The £19 delivery charge is a bit puzzling, and I wonder how this has been arrived at and how much testing of other options has been carried out. Perhaps it has been shown to increase the average order size and maximise profitability. Or perhaps Zara are still testing the water with a transactional website (which they don’t offer yet with the main clothing side of the business). Hi there, I’m utterly shocked £20 delivery???? i do alot of shopping online and have never come across delivery charges within the uk for such small items (i was looking to purchase 2 towels and a tumbler glass) how on earth have they come to charging such an amoutn for delivery….it’s coming from the uk…and the recommended time for delivery is 10 days! so not only do you get ripped of with delivery but it takes 10 days to receive your goods! I wonder how popular there online shopping site really is…..a shame as I woudl certainly be back for more items if not so expensicve with the delivery.